The rally is not about getting your unit fixed by Northwood- that should be done at your local dealer before you head out. If you really need Northwood to fix something then you need to schedule far in advance as they have limited time slots available during the rally. Also Northwood no longer has the personnel available to come out to the park and fix things for you so do not count on it happening. We will be gathering at Grande Hot Springs Resort (formally Eagles Hot Lake RV Park) Their contact # (541) 963-5253 and they will start taking your reservation after Jan 1. Contact them directly to make arrangement for a site. When you make your reservations make sure you tell them you are with the "Northwood Rv Owners Association" and are attending the 2017 rally. AARP, AAA or Good Sam discounts available. There is space for 75 units and it's a first come first serve so get your forms into me early. Once I start taking sign ups for the rally(after January 1st 2017)The park will hold your spot for 30 day but if I do not have your form in my hand within that time period the site reservation will be cancelled and available for the next person who calls. So make sure once your get that site reserved you get that sign up form to me. At the stop sign at the bottom of the exit ramp turn right(south) onto 203 for 5-7 miles. RV Park is on right down short 1/4 mile gravel road. Ok now to the good stuff! Early bird Activities for Monday. 5:30pm - Dinner at Mamacitas (menu on their website) - There is limited space so its first come first serve via the rally sign up form. 2:30pm - Blind man"s backing contest - This is a new idea for this year, I am having a mini Arctic Fox trailer made out of banners which will hook to the back of a golf cart. Two people will pair up, one driver and one guide. The driver will be blind folded and must navigate between cones forward to a stopping point then must back up to one side also marked out with cones as if backing into a RV site. It will be a timed event with time penalties for knocking over cones. 7:00pm - Welcome gathering - Rally Overview & Introductions in the Eagles Nest - First off I will be giving you all info about what's going on during the week and answering any questions you may have. Then we will all introduce ourselves. 9am - 1:30pm - Come make a table runner or a wall hanging at the LA GRANDE QUILT SHOP This pattern can be used as a table topper, a wall hanging, baby quilt, and whatever else a person can think up. The class is open to the first 10 that sign up and includes the pattern, the ruler needed to make this project, 4 hours of studio time, use of shop tools, and instruction. I would suggest that people have their fabric all ready prior to class, either bringing from home or shopping the day before at the quilt shop. So many details! Quilter's should bring their own machines. 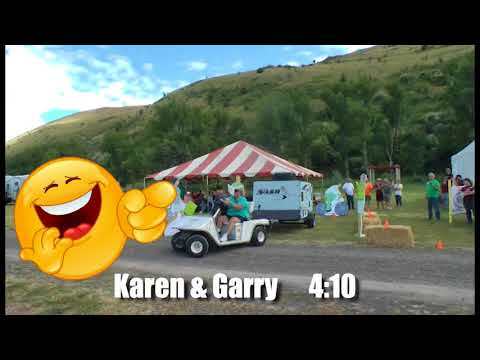 10:30am - Golfing For Grins: Heckling is not only allowed, it is encouraged!!!. Shotgun, Bowhunter and KandD will be setting up a little pitch and putt course around the RV park for nothing but fun and giggles. This will be a one club, one ball event that is open to everyone regardless of experience or ability. No need to bring your own club or ball if you don't have one, we will have plenty for you to borrow or share. Come have some fun and see how many balls Gus and the rest of us can put in the drink again this year. This event is free, but there is a possibility of a little side betting to add to the excitement. 2:30pm - White Elephant gift exchange UNDER THE BIG TOP by the Eagle Nest. You don't have to participate; you can watch the fun but HAVE to bring something if you want something. This activity has become quite popular/lengthy so this year I will be limiting the gifts to one gift per RV site, no exceptions. You give a wrapped gift and you receive one. The most fun ones are those where people are getting rid of something they don't want or use (new or in good shape is preferable) or an unwanted Christmas present. If purchasing something for this please keep the gifts worth to under $10.00. Could be a vase, knickknack, cd's, Tire pump, Purple Pig, Arctic Fox fix-it-kit, anything like that. 6:30pm Evening band Corey Peterson Band come on down with your favorite beverage in hand and enjoy the great music! Weather permitting it will be out behind the big top if the weather turns bad it will be inside the Eagles Nest. free time to sight see from 10:30 to 2:30 with lunch served at noon at Joseph community building(this is the location the busses will drop you off and also where you will get back on the buss to return to the RV park). If you enjoy historic buildings and interesting main streets; self guided centennial tour pamphlets of Joseph. 6:00pm Potluck Dinner - Coffee will be available. Please feel free to bring what ever you want, whether that be a main dish, vegetable, bread or dessert. Variety is the key to a good potluck! Take your dish with serving utensil to the canopy behind the Eagles Nest. There someone will direct you where to place it. Now return to the main building and have a seat for some brief announcements before you are excused by rows to serve yourself. Plates, napkins & Silverware are provided. 9:00am - 10:30 am SkyMed - in the Eagles Nest presented Bruce and Pauline Pokallus from SkyMed will be doing a presentation for Emergency Travel Evacuation. Its quite an impressive program, please come on down to the Eagles nest and give them some of your time. Coffee & dounuts/muffins and will also be available. 11:00am Celia's Gourmet Foods in the Eagles Nest presented by Tom and Jill. Come spend a little time learning about Balsamic Vinegar's and Olive Oils with the owners of Celia's Gourmet Foods. They will be sampling approximately 30 flavors of Traditional Barrel Aged Balsamic Vinegar's and Infused Olive Oils, all hand made by Tom & Jill themselves. They will probably sneak in a couple prepared dishes using their products for everyone to enjoy as well. If your in the mood, they might even let you purchase products during the demo. .So this year we will have three topics 1-Ham Radios 2-Solar systems 3-Holding tanks maintenance and usage. All three discussion will be happening at the same time and will take place 1pm to 2:30pm in the Eagles Nest. 9:00am - 11:00am Ladies Social Gathering and Crafts in the Eagles Nest. Everyone's welcome. Please come on over and see what's going on. Bring your own project, sewing machines, crochet hooks or any other things you might want to work with during this time or just come by to chat as this is more about socializing and connecting then any thing else. Besides the more the merrier! 9:30 am - Torklift - Come hear about the history of this Pacific Northwest company and see some of their products. 12:00pm- Northwood BBQ in Eagles Nest - Northwood & crew will be hosting a BBQ as well as a Raffle drawing with gifts given away. EVERYONE WEA R YOUR RAL LY TEE SHI RTS PLE ASE as we will be taking a group photo before we eat! 1:00pm approx. Northwood raffle - Everyone gets a prize! 8:30pm- Campfire Let all get together around the final nights campfire and share our last night together. 8:30am- Farewell Potluck Breakfast in community building, while this maybe early for some of you, many attendees have to get an early start to head home. Please feel free to bring whatever you would like, after all variety is the key to a good potluck! Any plans to having Performance Trailer Brakes back next year? Its great to hear you enjoyed yourselves It was a good rally with some exciting weather thrown in! Great write-up, Donna! Thanks so much. The video of the backing contest was hilarious to see at that speed! It's only Monday and trailers are rolling in! It's rally time! Many many thanks to those that helped get things set up. Gordon and Patrice, Michelle, Alexis and Ethan, and David and Donna who helped us set up the big top, put out chairs, and carry picnic tables. You guys were awesome. Monday we had a large group for dinner at Mamacita's, there were so many that we filled the basement, and some even had to be seated upstairs. Great turn out, and so nice to see all these familiar faces along with all of the new ones. It's been a lot cooler, and wetter this year and the mosquito's were out in full force, but Tuesday brought about 8 display models to the park along with some fun pre rally activities. Scott and Laura had the coffee going for everyone too! They travel all the way across Oregon to be here with us and each and every morning they have the coffee, tea and cocoa ready to start the day, then at the end of the evening Vern has a nice campfire for us to gather around!!!! Thanks guys!! Tuesday bingo started our activities --thank you Tom for running that. You barely got to camp and got put to work. !! Just shortly after was a new event of blind man's trailer backing. Northwood's production dept. took Adam’s idea and designed a fantastic mini Nash trailer that we could hook up behind a golf cart. We got a great laugh to see Adam's face in one of the trailer windows, and they even designed pedestrians for the course! The backing contest had the driver blinded with the passenger verbally guiding him to pull up then back into a designated spot. Each team was timed, and then scored by random people in the audience with numbers they held up. Sooo much FUN!!! Once evening hit we had the official start to the rally with the "Meet and Greet" in the building. Adam went over announcements, and then introduced the park owners Mike and Tamarah. Haven't they done a nice job with the park! Afterwards each group attending the rally introduced themselves telling names, where they are from and their forum handles. To end the evening we went out to the campfire with Vernon and Sharon and were lucky enough to see the owls come out for the evening. We watched them fly overhead several times. Wednesday morning started with Performance Trailer Brakes in the building doing a class on disc brakes, while at the same time Mary, Betsy, Claudia, Marie, Shelley, Doris, Julie, Janet, Donna, Paula, and Sybil all enjoyed a 4 hour quilting class in La Grande that even included lunch! Back at the park Tom and Bob did a fun thing called Golfing for Grins. They set up quite the course around the park, and there were many participants. With one hole being you had to hit a pie time suspended in the air! At 2pm we had the ice cream social with all the toppings, and oodles of fruits. The White Elephant followed right after, and we saw some very interesting gifts! There was a true White Elephant, and yes there were many returns including the purple pig with all the dates printed on it and the doll, and that is truly the only way I can describe that one, there just aren't words...! That evening we tried to have a band play outside on the band stand, but the weather just did not co operate. We got thunder, lightening, hail, and rain so the band downsized to a guitar and a violin, and played in the building for us. They were real troopers and the music was very enjoyable. Thank you Corey Peterson Band! As it turns out the band made a great decision because just not too long after they finished, we got one heck of a storm! Thunder was clapping so loudly that we heard at least one truck alarm twice, lightening was happening and it was raining sideways. After the worst of it past we were under water in our site and Adam measured 5 inches on the ground at our step. He was out there in his swim trunks and water shoes checking on things, then again at 4am the next morning placing boards and stepping stones (borrowed from the park!) so we could get out of our trailers without getting having to wade thought the lakes left behind! Thursday brought our excursion to Joseph. The buses showed up on time (yay!) and thanks to our bus leaders Dave, Donna, Scott and Laura got everyone checked in so we could enjoy a scenic ride to Joseph, Oregon. Also thanks for helping make sure all who went were accounted for before we returned! The weather cooperated and we got to spend the day shopping, and site seeing along with a catered lunch in the community building. Thanks Adam for all of your planning and putting it all together as well as all of those who jumped in and helped him set up and tear down the tables/chairs. Once we made it back to the park some of the water was gone. Not all, but it was looking much better. At 6pm, we had our pot luck with waaaaay to much food, but I do have to say we have some incredible cooks in camp!! Friday morning started the day with SkyMed, I think they have been here for 3 years now offering insurance that covers for some great things like getting your RV back if something happens to you. The coverage is extensive, and not a bad idea! After SkyMed Tom, and Jill took over the building and taught us about GOOD balsamic vinegars, and oils. There were many flavors, and samples for everyone to try. They did mention that you can order online (there is a link at the top of the page on this site) called Celia's Gourmet Foods and there are 450 recipes on their site too! We tried something new this year as per suggestions, and next up was "Small Groups." Those that wanted to attend met at the building and broke into 3 groups. The topics covered this year were Holding tanks, Ham radios, and Solar. Turn out was really good, and looked like all kinds of wisdom was being shared. =) 3;00 was the Factory tour, and then that evening back in the building was our Social night put on by Bill, Mary, Bob and Betsy. There was a whole table full of wines to taste, and everyone brought snacks to share. They showed drone video (provided by Larry!) of the backing contest, and then some pics from this week. There was also a few contests like longest couple married, oldest dog, who traveled the farthest, and oldest rig, and who had the most grandchildren. Prizes were given out, and from the looks of things everyone had a really great time. It was even announced that SOMEONE happen to notice that Adam has been wearing what appears to be the same green shirt all week!?! He's been waiting for someone to say something...lol. I have to tell you though that I did laundry this morning, and washed 4 of the 7 he has so I promise they were clean. We finished the night at the campfire with Vernon and Sharon. Thank you Vern for always providing that evening campfire! Saturday morning the ladies started in the sewing hut with quilting, crocheting, and knitting going on. There was talk about cross stitch too, and a project making Christmas stars that looked really interesting. Torklift came, and did their presentation, and before we knew it it was already time for Northwood. Lime green shirts took over the park as we all gathered for the group photo, then everyone was in line for ribs, chicken and pulled pork. The raffle seemed to go pretty fast this year, but prizes included weather stations, outdoor mats, artic fox chairs, tool kits, led lanterns, and many many more. The grand prize was a gas pressure washer that went to Gary. He was thrilled as he's getting ready to paint his house this summer and was going to have to buy one! It's been a very busy and full week so some went back to their trailers for some down time while others gathered around the park visiting for the afternoon. We finished the evening with a movie back in the building. "Gone Fishing" with Danny Glover and Joe Pesci. Everyone was served popcorn and we just enjoyed the last evening. Sunday morning we met for a pot luck breakfast before heading home. The group is always smaller for this event as some have to pull out early. As always thank you so much for pitching in and helping to take everything down and clean up the building. You guys are incredible, and with so many helping hands it goes really fast!!! We really enjoyed our week with our R.V. family and hope that you guys did too. We wish for each and every one of you safe travels and many blessings until next year! Ok the write up and photo's are being finished today and will be posted shortly. Just added Riches back up video to the back up contest my prior post #131 that had the times and scores done on Tuesday for those of you who want to see it. I never knew RV mats float... Check for leaches lol. 8am busses have been replaced by cruise ships, a first for the rally. An awesome adventure and we hope it is less then that 3 hour tour we know about. By the way, going to take extra lead to get your bait to the bottom tonight! Well we got thunder,lightening, hail, and rain so the band downsized to a guitar and a violin, and played in the building for us. They were real troopers and did a great job! Tonights band performance has been moved into Eagles Nest due to weather! Will be starting at the same time. I have posted the bus list in the eagle nest building. You will want to head down and see which bus you are on before Thursday morning. Ok the Blindman's backing event is over below are some photo's and everyone's score/time. Each person was scored by a panel of impartial but slightly swayable judges!